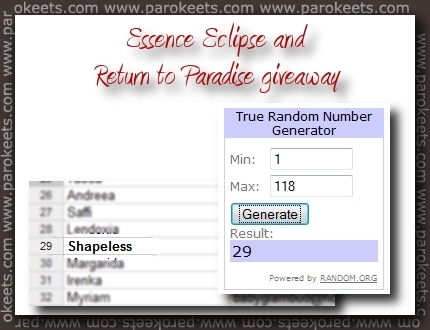 The winner of our Essence Eclipse and Return To Paradise giveaway is chosen. Computer program randomly picked out one number and winner is 29th entry made by … Shapeless. Email is already waiting in your Inbox. Don’t forget you have 48 hour to reply. Thank you all for participating in Essence giveaway. You still have a chance to enter our Summer is here! giveaway. .-= rijaH´s last post … Positive =-.